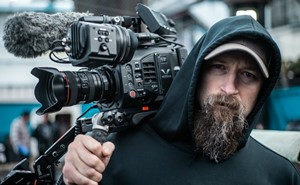 The new season of the Emmy Award-winning docuseries “Deadliest Catch,” premiering today, April 9 at 9 PM ET/PT on Discovery Channel, was shot on the forbidding Bering Sea with seven VariCam LT 4K and 17 AU-EVA1 5.7 K cinema cameras. Produced for Discovery by Original Productions, “Deadliest Catch”—a perennial hit--portrays the real-life events aboard fishing vessels during the Alaskan king crab and snow crab fishing seasons. The Aleutian Islands port of Dutch Harbor, Alaska, is the base of operations for the fishing fleet, and the show's title derives from the inherent high risk of injury or death associated with the work. The show emphasizes the dangers on deck to the fishermen—and camera operators. Filming of this 15th season began last October and continued through early March. A two-person TV crew lived on each of the seven boats profiled, and could count on many 20-hour shooting days. Generally, one cameraman, operating a VariCam LT, was assigned to document the captain stationed in the wheelhouse, while the second camera operator, working run-and-gun with an EVA1, followed the crew on the deck. “Deadliest Catch” was shot in Pro Res 4:2:2 HQ (VariCam LT) and 4:2:2 All-Intra 1080p (EVA1). The VariCam LTs were outfitted with Canon L series lenses (EF 16-35mm, EF 24-70mm, EF 70-200mm, and EF 35mm and 50mm Primes,) and the EVA1s with Canon EF 24-105mm lenses. Max Post (like Original Productions, a Fremantle Media company) is handling the edit on the Avid Media Composer platform. More hours of content were shot this season than ever before, 25 hours plus an additional six hours for special and recap shows. Original Productions is currently utilizing the VariCam LTs and EVA1s on an original series for a premium content provider. “Having these Panasonic cameras places us at the forefront of camera technology and enables us to meet the strict criteria of established and emerging premier content producers,” Montagna said. For more information about Original Productions, visit http://www.origprod.com/. For more information about “Deadliest Catch,” visit https://www.discovery.com/tv-shows/deadliest-catch/. The AU-EVA1 5.7K handheld cinema camera is distinguished by a pixel count of 5720 H x 3016 V (17.25 million), Dual Native ISO ratings of 800 and 2,500, and 14-stops of dynamic range. The newly-designed EVA1 sensor is Super-35 sized (24.60mm x 12.97mm) with 5.7K resolution. With an active resolution of 5720 x 3016, the EVA1 delivers more than 17.25 million photo sites, nearly double the 8.8 million for 4K DCI (4096 x 2160). Weighing only 2.65-lbs (1.2Kg, body-only) with a compact form factor (6.69” H x 5.31” W x 5.23” D) and a removable handgrip, the EVA1 can be used for efficient handheld shooting applications. Because of its compact form factor, it can also be mounted on a drone, gimbal rig or jib arm for complex yet smooth camera moves. The VariCam LT camcorder inherits the same super 35mm sensor and superb imaging capabilities that distinguish the award-winning VariCam 35, but with significant reductions in size, weight and price. Incorporating this identical imaging “DNA” in a more compact rendition, the VariCam LT delivers 14+ stops of dynamic range with V-Log, and the esteemed cinematic VariCam image quality and color science, as well as the VariCam 35's breakout innovation, dual native ISOs of 800/5000. Weighing just under six pounds and having superior capability to similar sized cameras, the VariCam LT is the ideal camera for handheld, SteadiCam, jib, crane, drone, gimbal and overall cinema verité work. The VariCam LT offers a host of new features including an EF lens mount, hot swappable batteries, IR shooting capability, a 23.98 PsF output, cinema style file naming, and image presets such as scene files. For more information about Panasonic cinema cameras, visit https://na.panasonic.com/us/audio-video-solutions/broadcast-cinema-pro-video/cinema-cameras, or contact Panasonic at 877-803-8492.